Whether you choose to relax in the comfort of your lodge or enjoy spectacular view veranda you will be reminded time and again of the endless beauty around you. The beauty of this lodge is that it offers our guests luxurious and private accommodation. game rich reserve affording guests wonderful sightings of big game during the periods between our daily safaris. The Tree lodge at Sikumi is located in the heart of the Lions Paradise Game Reserve, sharing a border with the renowned and vast Hwange National Park. 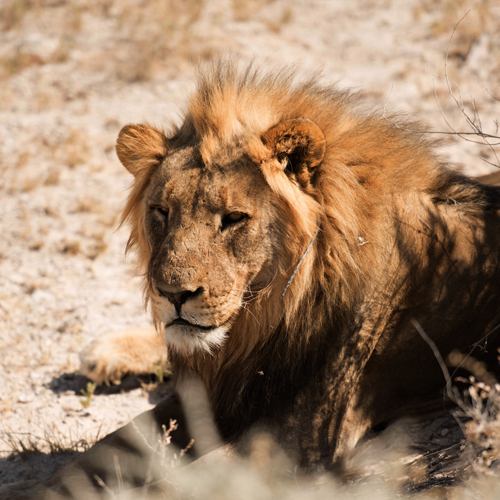 Your stay here will give you an unforgettable wildlife experience as you will enjoy close safe viewing of Elephant, Lion, Buffalo, Leopard, Kudu Giraffe and a host of different game. Nestled high up on strong Mangwe (Ndebele) Trees, your cosy chalets have en-suite facilities, hot baths for those mid-winter evenings after a discovery filled day and cold showers for those mid-summer nights after a warm, adventurous day in the breath taking African bushveld. Your mornings will be greeted by the serene melody from a choir of the diverse bird species that nest on the tree branches and the scintillating sun rays will peep through the canvas curtains to announce another exciting day for you. ◊	9 cosy single/double rooms. ◊	4 spacious family rooms. ◊	Indoor & Outdoor dining. ◊	Well maintained Swimming Pool. 3-4hour Game-drives (morning and afternoon) in our concession and in the park. Rhonda p, London, United Kingdom - Spent three nights at this charming lodge over Christmas and thoroughly enjoyed our stay, the tree houses are great fun each have their own balcony with lovely views of the pan and water hole. The water hole attracts loads of game all day long. We arrived a couple of hours after an elephant had entered the lodge and emptied the pool. Thanks to all the staff for making our Christmas so memorable! kimtai “Amazing Safari” Best safari in Africa! Saw a lion hunt , a leopard , herd of elephant, wild dogs , ibexes, and had a great fire side chat with good friends under the starry African sky! This is the place for memories in paradise! The breakfast was typical English bangers , beans and fried eggs! The guides were extremely knowledgeable kind and fun! “rustic, natural, authentic” we spent four marvelllous days at Sikumi and saw many elephants, baboos, zebras, impalas, kudus, buffalos, giraffes, lions and many different birds. Our guide David, a wildlife passionate, explained us so many things about life and habits of these animals. 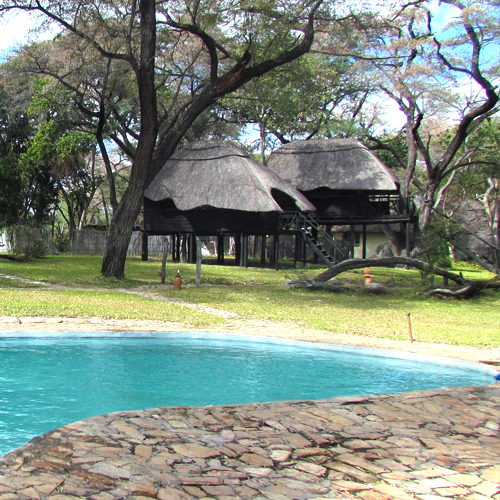 The lodge is perfectly situated at the edge of a large open valley near a very well visited waterhole. The tree houses are cosy, rustic, and yet have everything you need, even a hot water shower. The manager Toko is extremely helpful. and friendly, and we were delighted with Angie's typical African food. If you look for authenticity and not for luxury, Sikumi is your place! Unforgettable! And prices are reasonable. With us you will enjoy an excellent combination of sightings, smells, sounds and knowledge as you adjust your eyes and ears to Africa’s nature show. 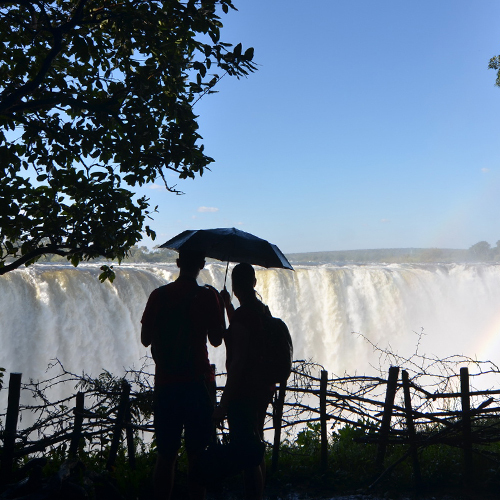 We look forward to welcoming and leading you to the magnificence of Africa.